Tungsten wedding bands offer sleek contemporary styles for reasonable prices, but is tungsten the right metal for your wedding band? Use this helpful guide about tungsten carbide wedding rings including pros and cons, characteristics of tungsten wedding rings, best styles and styles to avoid, need to know shopping tips and more. Discover what this type of wedding ring metal really offers and if this is the right material for your ring. 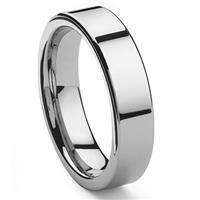 Tungsten rings are much heavier than cobalt, stainless steel and titanium rings. 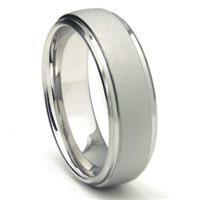 Tungsten rings are crafted with tungsten carbide - a compound that contains equal parts of tungsten and carbon atoms. 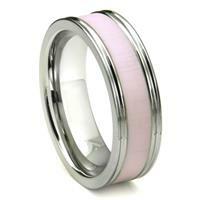 Tungsten rings are highly resistant to scratching. And if you have any questions about tungsten rings, or you would like to leave a review of a tungsten wedding ring, use the handy comments box at the end of the page! What is tungsten exactly? Tungsten is a chemical element, also known as wolfram, and it has some pretty amazing properties. Out of all the metals, tungsten has the highest melting point and the highest tensile strength. It is extremely durable and somewhat rare. 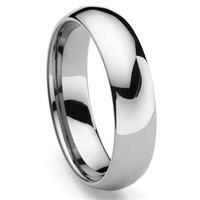 But tungsten wedding bands are not made out of pure tungsten - instead they are made out of tungsten carbide. Pure tungsten is too difficult to work with, so tungsten that is used for industrial applications - and in jewelry - is compounded into its carbide form. Tungsten carbide is created by combining an equal number of tungsten and carbon atoms. The result is a very fine powder which is then mixed with a binder - like nickel or cobalt - to create a compound which can be crafted into different shapes - like razor blades and wedding rings. Tungsten carbide rings retain many of the characteristics of pure tungsten metal - including a high melting point and high tensile strength. The rings too are extremely resistant to scratching, and have a light gray color which can be darkened with brush finishing processes. Tungsten carbide wedding bands have moderate heat and electrical conductivity properties - so if this is a concern for you, it might be best to go with a wooden wedding band or a stainless steel wedding ring (or remove the band when working in a capacity where electricity and heat pose a safety issue). It is a common myth that tungsten carbide rings cannot be removed during an emergency - but they can be removed in the event of an emergency using regular jewelry removal tools. 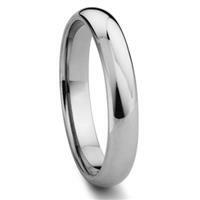 Tungsten wedding bands are also somewhat heavy - just a touch heavier than 14k gold. 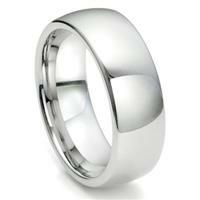 Quality tungsten wedding bands are made with jewelry grade tungsten carbide compounded with a nickel binder. While nickel in gold alloys can cause allergies in some people, the amount of nickel in tungsten carbide is extremely low plus bonded so tightly to the other atoms in the ring that allergy risks are low. Tungsten carbide compounded with cobalt binders should be avoided - completely - for wedding rings and other types of jewelry. Not only does the cobalt cause allergic reactions, but the cobalt reacts with the oils in the skin and can create a permanent stain on the rings. There are different types of jewelry grade tungsten carbide, and rings made with quality tungsten carbide (which contain a low amount of nickel and a high percentage of tungsten and carbon) are priced higher than rings made with lower quality tungsten carbide grades. This is why you'll see a wide range of prices for tungsten rings - all the way from $10 dollars to over $500 for designer bands with diamonds. 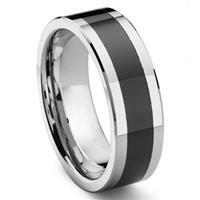 What about Black Tungsten Rings? 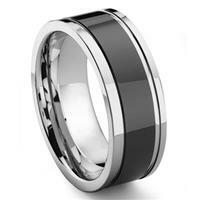 Most black tungsten rings are made with a plate over the natural gray tungsten. Unfortunately, any type of plate will eventually scratch - even if the plate itself contains some tungsten carbide ingredients. For this reason, Everything Wedding Rings recommends avoiding black tungsten wedding bands - with one exception. Titanium Kay has recently launched a new tungsten carbide wedding ring design with solid black inlay that is 100% scratch proof. So, if you are looking for a tungsten ring with black inlay features I highly recommend one of the Titanium Kay 2nd Generation rings. (Only the 2nd Generation rings are made with scratch-proof solid black features). Are Tungsten Wedding Bands Brittle? Tungsten carbide is extremely durable, more durable than gold, palladium, silver or platinum - and highly resistant to scratching - but it does have brittle properties. This means that if enough pressure is applied to a tungsten wedding ring, the ring will crack or break instead of bending like, for instance, a gold or platinum ring. How brittle are tungsten wedding bands? 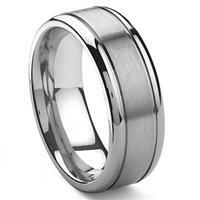 Tungsten rings made with quality grade tungsten carbide will not break unless extreme force is applied to the ring. Some people actually prefer the fact that a tungsten ring will break - instead of bending - if extreme force is applied to the rings. 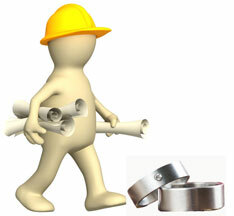 (Men's tungsten rings are especially favored by men who work with heavy machinery or heavy objects because of their break vs. bend properties). But because tungsten carbide does have these qualities, many reputable retailers of tungsten carbide wedding rings offer lifetime warranties for their rings - if the rings do break, they will be replaced at no charge. 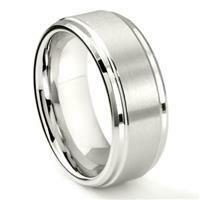 So what are the main pros and cons of tungsten carbide wedding rings? Tungsten carbide rings are extremely scratch resistant and are more durable than many other types of traditional wedding ring metals. Tungsten rings may also be engraved with a laser engraving tool and the rings are available in a variety of finishes including the highly polished mirror finish and the darker gray brush finish. Tungsten bands too - even high quality designer bands - are available for reasonable prices which are often much less than gold or platinum bands (though somewhat higher than titanium or stainless steel bands). 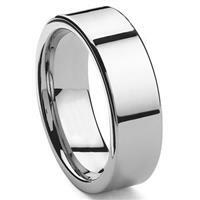 Tungsten rings are also resistant to corrosion and tarnish, and they do not require rhodium plate. The cons to tungsten carbide rings? The main con is that these rings cannot be resized. 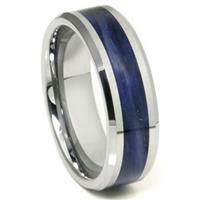 If you are looking for a contemporary wedding ring metal that is re-sizable, cobalt chrome may be the best option. 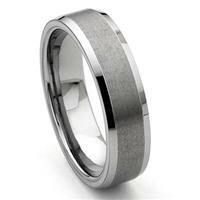 Tungsten carbide rings are also limited in style selections at this time. Right now, men's tungsten rings are available in many more styles than women's tungsten rings - but even men's tungsten wedding bands styles are limited to sleek modern designs because tungsten carbide is not very malleable. Some of the most popular styles of men's tungsten rings include comfort fit rings, flat bands, channel set diamond tungsten rings, and rings with brushed layers. Available women's tungsten wedding ring styles include thinner contemporary bands, channel set diamond rings and tension set tungsten engagement rings. If you are interested in a tungsten tension set ring, stick with tension rings set with sapphires, rubies, moissanite or diamonds. Gemstones must have at least a 9.0 rating on the Moh's hardness scale to hold up to a tension setting, yet unfortunately there are many tension set rings on the market - including tungsten tension rings - which are made with cubic zirconia, topaz, aquamarine etc. which will eventually shatter or crack in a tension setting. 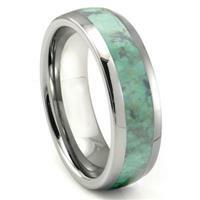 If you are searching for two-tone tungsten rings, go with rings made with inlay only. Any type of plate - including gold plate - will quickly wear away on rings that are worn every day. Stick with retailers who offer a lifetime warranty or guarantee on their rings plus some type of return policy (just in case the rings do not fit). Remember to avoid plate of any kind - including black plate. 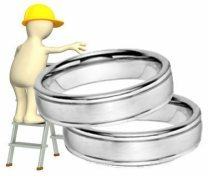 Purchase your rings from a business that uses jewelry grade tungsten - and remember to avoid tungsten cobalt wedding bands completely (if the retailer cannot tell you what the rings are made with, go somewhere else). 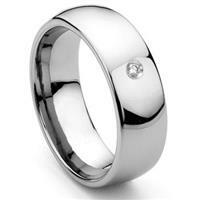 Because tungsten rings cannot be resized, make sure the correct ring size is obtained. Visit a local jeweler at least twice - and at least two weeks apart - and have your ring size taken later in the day. While there are many extremely cheap men's tungsten wedding bands and women's tungsten rings available, with tungsten rings you definitely get what you pay for. Most quality tungsten rings are priced at over $50 dollars - if you are looking for a ring that is priced under $50 dollars then stainless steel or titanium bands may be a better option. 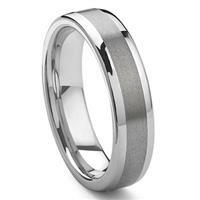 Do you have comments or questions about tungsten wedding bands? 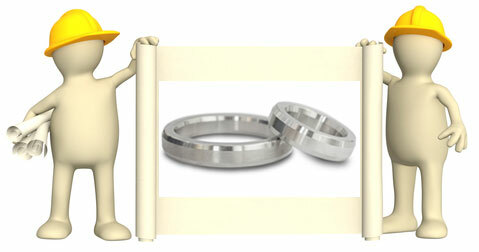 Send in your questions, reviews and comments about tungsten wedding bands, or share pics of your tungsten rings here! 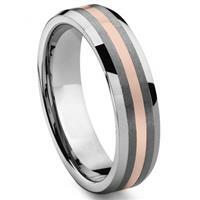 How can you tell between tungsten cobalt and tungsten nickel rings? Did you know that only a few types of gemstones can be used for lasting tension set rings? Tension Set Wedding Ring here!